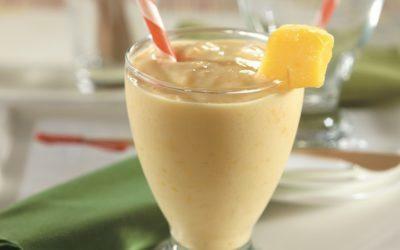 Combine 2 cups mango chunks, yogurt, orange juice, vanilla, if desired, lime juice, and salt in blender; blend until smooth. Pour into four glasses. Garnish with additional mango chunks. Note: Mangoes are an excellent source of vitamin A and are a very good source of vitamin C. They also provide potassium and fiber, and they’re sodium-free. If you can’t find frozen mango cubes, you can make your own. Cut mango into 1-inch chunks; place on cookie sheet and freeze for about 3 hours. Serving size: about 5 ounces. Exchanges per serving: 1 1/2 Fruit.